New book, 288 pages. In 1765, eminent botanist Philibert Commerson was appointed official naturalist to a grand new expedition: the first French circumnavigation of the world. Desperate not to be left behind, Jeanne Baret - Commerson's young mistress and collaborator - disguised herself as a teenage boy and signed on as his assistant. Amid deceit and suspicion Baret travelled the world, surviving for two years on a boat with over one hundred men. When she next set foot on French soil she was the first woman to ever sail around the globe. Yet so little is known about this extraordinary woman, whose scientific contributions were quietly dismissed and written out of history - until now. 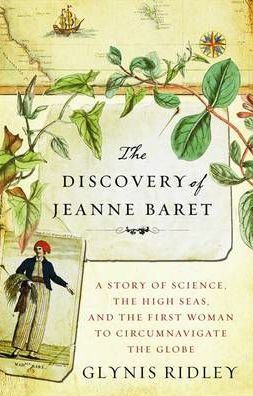 In The Discovery of Jeanne Baret, Glynis Ridley unravels conflicting accounts recorded by Baret's crewmates to piece together the real story: how Baret's identity was in fact widely suspected within just a couple of weeks of embarking, and the painful consequences of those suspicions; the newly discovered notebook, written in Baret's own hand, that proves her scientific acumen; and the thousands of specimens she collected, most famously the showy vine bougainvillea. Anchored in impeccable original research and bursting with unforgettable characters and exotic settings, Ridley brings to life Jeanne Baret and her pioneering journey, and offers this forgotten heroine a chance to bloom at long last.